Nowadays, the automation control system is being an integral part of the technological process at plant, factory and production line. NEXCOM’s equipment covers all stages of technological process for any industrial application and object. On the first field level remote I/O modules are connected to the field controller NIFE100 with Fieldbus Expansion Ability for data gathering from temperature, pressure, power and other DI, DO, RTD, RTC sensors and modules. 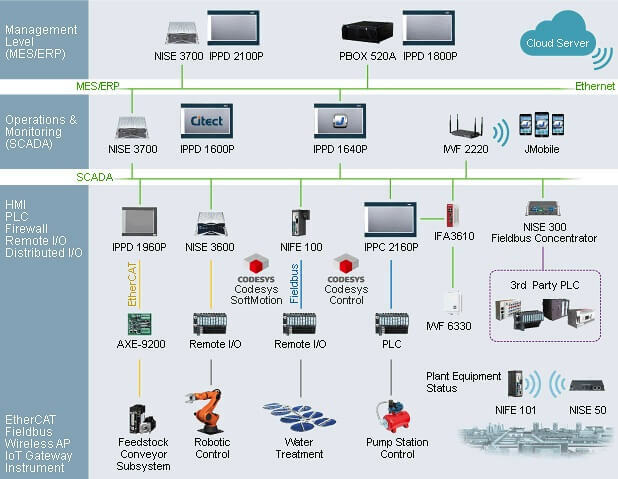 Flexible NIFE100 offers a variety of industrial fieldbus protocols such as EtherCAT, Ethernet IP, DeviceNet, Profibus, ProfiNET, SERCOSIII and CANopen. For third-party PLCs connecton, NISE300 Data concentrator with outstanding system performance can be used. NISE300 4th Generation Intel® Core™ i5 Fanless System provides 6 mini-PCIe Expansion and User-Friendly Front I/O Design which makes it a real versatile box for various factory automation applications. The Intel® Atom™-based IoT Gateways NIFE 101 and NISE 50 are capable for multi-protocol conversion and factory equipment parameters transmission to cloud services. The factory equipment parameters can be also transmit wirelessly by means Industrial Wi-Fi devices, including indoor APs and outdoor IWF-series with IP55 protection and extended temperature range from -40°C to 80°C. Additionally, some models like IWF 310 provides cost-effective and easy solution for building Mesh Network inside the whole factory. This Industrial Access Point capable to gather data uninterruptable and effectively even from moving objects. Moreover, to control a medium-scale Wi-Fi network up to 150 access points, the industrial Wi-Fi controller IWF 8405 can be used. Network security is also a very significant aspect in modern networks. The IFA-series provide VPN function, packets inspection, DoS/DDoS protection, intrusion prevention and other security functions. The fanless computer NISE 3700E is a good choice for operating/ monitoring and management levels of the system. It was specially designed where high CPU and graphics performance needed. So, this powerful computer is suitable for SCADA, MES, and ERP applications. 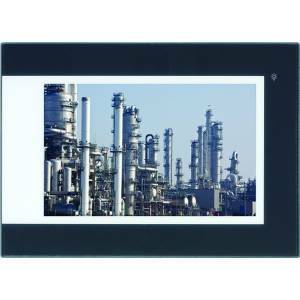 For data visualization and control, NEXCOM offers heavy Industrial Panel PC (IPPC) and heavy Industrial Touch Monitor (IPPD). These industrial Panel PCs and Monitors provide expansion slots and IP66 heavy-duty aluminum enclosure for any harsh industrial environments and applications. Thus, NEXCOM offers a full range of products to build an up-to-date and sophisticated digital infrastructure of any industrial application for all customer needs.